The predicted rain began around noon. Hesitantly at first, then casually, then boldly. 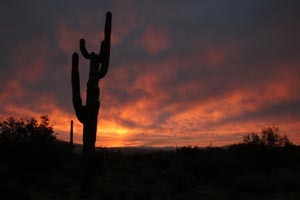 A desert winter rain: steady, persistent, protracted (some might say: interminable). A gray, heavy, wet, soupy day. A good one to sit around the fire curled up around a hot cup of coffee and a hot bowl of soup. 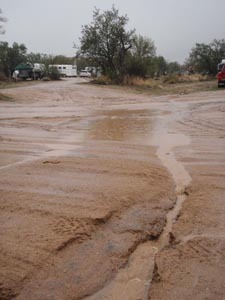 Into the evening, little puddles became little lakes; little trickles became little streams down the washes and roads. 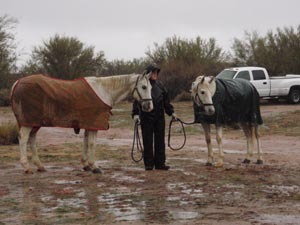 Soggy horses, and a few stunned people who expected the sunny warm skies ("It's Phoenix for crying out loud!") and didn't bring rain gear or winter tights. Some people from New York and the Northwest and Utah thought they'd escape the snow and rain for the warm and dry Southwest. 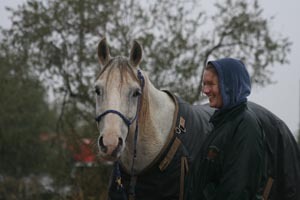 But plenty of smiles and large doses of humor lit the faces of the 40-some intrepid endurance riders vetting their horses in, that didn't cancel (down from 90-some pre-entries), and who planned to mount their horses at 7:30 tomorrow morning for Day 1 of the Resolution Endurance Ride. 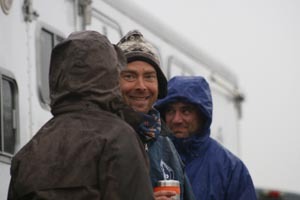 Ride manager Rusty roamed base camp with his hands wrapped around a cup of hot chocolate and a laugh on his lips. Trails are marked, everything is ready, and there's nothing to be done about the weather but saddle up and ride!